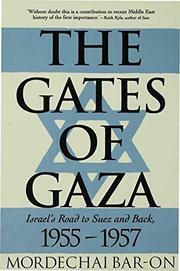  An intimate, full, and insightful account of the Suez Crisis from the then head of the Israeli chief of staff's bureau. Mordechai Bar-On draws not only from official army sources and from a massive research effort, but from his personal diary kept while serving as General Moshe Dayan's recording secretary. The reader is therefore privy to many a tense moment shared by Israelis like Ben-Gurion, Abba Eban, Dayan, and Golda Meir, while the author fleshes out the global picture with quotes from the likes of Egypt's Nasser, England's Eden, America's Dulles and the UN's Hammarskjold. Bar-On documents the fact that Israel did contemplate a pre-emptive attack on Egypt after Soviet arms turned Nasser into the regional power. But Israel canceled those plans, insists the author, after the French sold her sufficient weapons to defend herself. Contrary to popular conceptions, Bar-On attempts to establish that it was only Nasser's nationalization of the Suez Canal and the subsequent Anglo-French decision to invade that brought Israel into the picture. The British are shown to have done Israel dirty after promising diplomatic support to cover the Jewish state's takeover of the Sinai peninsula. Bar-On sees Israel winning long-term gains while losing her claims to Sinai, Gaza (sound familiar? ), and a toe-hold on the Straits of Tiran. The Eisenhower Doctrine is seen as assuring Israel's diplomatic defeat, but Bar-On looks to the period of 1957-1967 to underscore what the Sinai misadventure gained for Israel: It ``reasserted Israel's deterrent capability,'' allowed the young nation and the port of Eilat to bloom, and even gave her the right to casus belli with the renewed Red Sea blockade of 1967. A valuable, multidimensional history of a crucial period in Cold War and Mideast history.